The expression “Good data begets good policy” not only applies to public policy, but also to an insurance policy – especially a flood insurance policy. A new analysis reveals the peril we create when we use old data to rely on providing proper and sufficient insurance coverage. 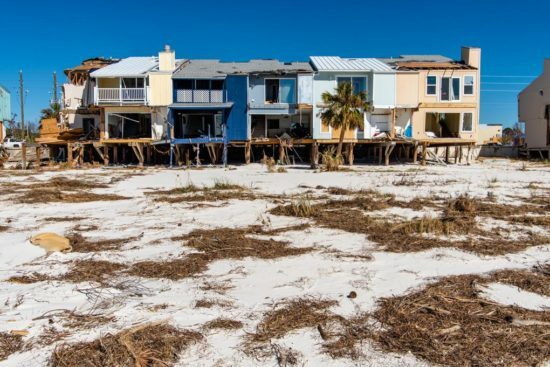 Two hundred Mexico Beach homes sitting beach block from the Gulf of Mexico, yet labeled X-Zone for flood risk by FEMA, were nearly wiped out by Hurricane Michael: 70% of the homes were destroyed and another 10% were severely damaged. The analysis by coastal geologists from Western Carolina University appeared in a recent article by Inside Climate News and notes that many of the maps were outdated and don’t factor in changes in extreme weather. Lulled into complacency by being placed in a minimal flood risk zone, many of those 200 residents reportedly had no flood insurance and face the brunt of rebuilding costs on their own, should the damage turn out to be more from the water than the terrific 155+ mph winds. The FEMA flood maps for Mexico Beach were last revised relatively recently in 2009 but were based on a maximum storm surge of 10 feet. Updated U.S. Geological Survey data shows storm surge at Mexico Beach reached 15.55 feet, about a half-foot higher than previously reported. That doesn’t include the 5-foot waves on top of the surge. FEMA, which has been criticized in the past by its own Inspector General for using outdated flood maps in determining various flood risk zones, responded in the article by saying that “an individual storm, particularly a major storm like Hurricane Michael, may cause flooding in areas beyond the high-hazard areas.” So true and it echoes what many of us in the know about flood insurance preach: flood waters don’t respect lines drawn on a map. 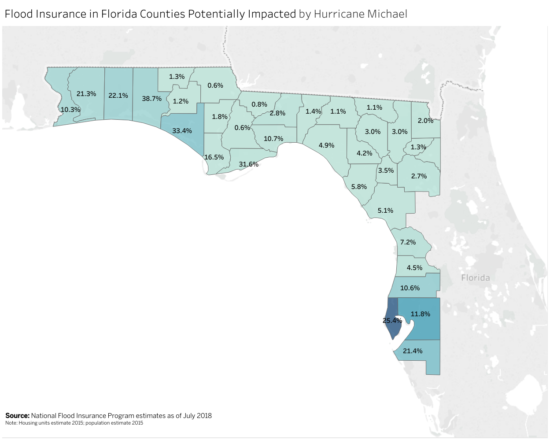 Only 34% of Bay County, home to Mexico Beach and some of the worst damage in the 13-county impact zone, had National Flood Insurance Program (NFIP) policies. This so-called “uptake rate” of federal flood insurance is less than 1% in nearby Liberty County. This map below shows the percentages of properties in these high-risk counties that have NFIP policies. Percentage of homes by county with National Flood Insurance Program (NFIP) policies. Click on image for interactive version. The article has some stark photos of the Mexico Beach damage and provides insight into the methodology used by the coastal geologists. It is an interesting and thought-provoking read.